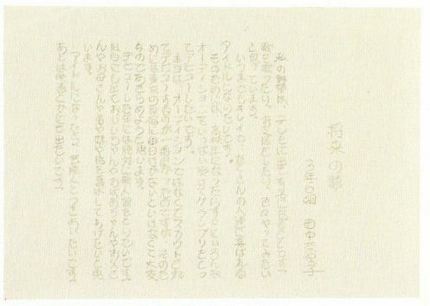 Mihama's graduation anthology "Miracle", obtained after she drowns herself in the (red) spring on the grounds of Mizuhiruko Shrine on Day 2 at 3:33. 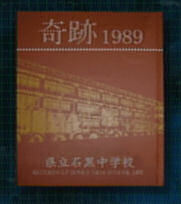 It was published in 1989 by Ishiguro Middle School. Her dream for the future - "I want to become an idol who sings, acts, is always pretty and makes lots of people happy" - is innocent and naive, but also shows that she has long had confidence in her natural beauty. 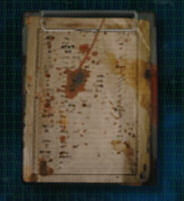 Only part of the page can be seen in the in-game archive, but as you can tell by looking at the photography prop, it is actually a complete composition filling the page. According to Ms. Sato, who was in charge of things like background data, "We put a lot of effort into making it, making sure her curvy writing was perfect." In actuality, Mihama's graduation anthology causes questions to arise over whether she is falsifying her age. Since she graduated from middle school in 1989, you can guess that she was most likely born in 1974. However, it says in places like her profile that she was born in 1976. Also written in her gravure article in archive [No.006] BANG is "All about Mi~na at the age of 20!" Her being called 20 in an issue of BANG published in 1996 means that, like her profile, here too she would have to claim to have been born in 1976. She may have faked her age by two years as a tactic to sell herself as an idol, but when you think of Mihama's fate it's rather sad. My ambition is to appear on TV and become famous. I want to become an idol who sings, acts, is always pretty and makes lots of people happy. In order to do this, as soon as I become a high school student I want have lots of auditions, win Grand Prix and make my debut. To be honest, I would prefer to be scouted and debut that way rather than have auditions, but to do that I would need to go to Tokyo and visit Harajuku every day, and that sounds like a lot of work so I've decided to give up on that. I definitely want to win the Newcomer Award the year I make my debut. I also want to appear on Kohaku and make my grandad and granny and father and mother and little brother and sister and everybody happy. When I become an idol, I want to make friends with performers. Then I will be in movies, too. A report on Miyata's findings after capturing the Shibito-turned sisters Mina and Risa Onda and performing all kinds of experiments on them in the Miyata Clinic basement laboratory. 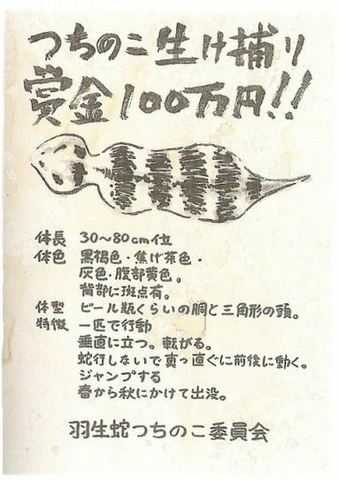 The way Miyata announces that he has found the "secret of eternal life" after cutting up the sisters' bodies shows signs of something completely different to that of a doctor's sense of curiosity. As written in chapter 5 of the side story "Strange Tales", when Miyata was a boy he had already confronted the Shibito Namiko Yoshikawa (the girl with a red backpack from "Strange Tales" chapter 1) in the special ward in the basement. It is not made clear what the teenage Miyata did to the Dog Shibito after getting his hands on her, but perhaps this is not the first time Miyata has sought the "secret of eternal life". An image of angels blessing the coming of the visiting god, extolling its glory and announcing its arrive to the people of earth. 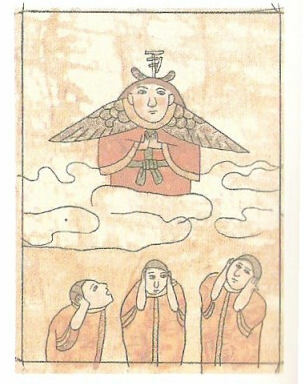 Mana crosses can be seen on the angels' heads. All of the three "people of earth" shown are covering their ears with their hands, hinting that there is likely an ear-piercing siren ringing out at the time. 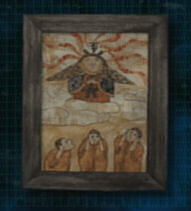 It shows that there is an inextricable relationship between the coming of the god an dthe sound of the siren. 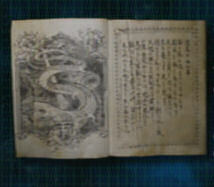 The legend of a great sea serpent (Ribi-ya-tan) from the scriptures "Book of Heavenly Salvation". It shares several features with the "Leviathan" as told of in the west, sppearing from the bottom of the sea and giving off a light that clouds the sky. This is likely an imitation of the "light pillars" phenomenon that can be observed as an omen of the coming of Datatsushi. 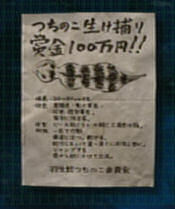 A legend told in Hanuda Village. One day, a strange-looking boat in the shape of a bowl with a glass lid came floating down the river. 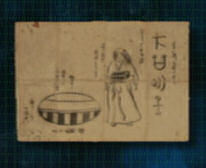 It was engraved with strange, Sanskrit characters, and upon it was an odd woman with white hair and red eyes. Apparently there was something precious inside the box she cradled carefully in her arms... This legend obviously tells of Hisako passing through space-time from 2003 to deliver the holy object (Datatsushi's head). 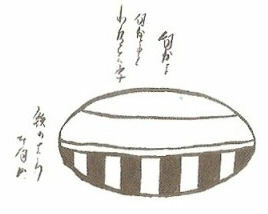 This means that in other words, the Utsubobune is the very altar used in the ritual to revive Datatsushi. She appears endlessly, everywhere.